I begin almost every day with the same routine: get up long before my wife and kids, shower, spend about 5-10 minutes in quiet prayer, eat breakfast, and then play a video game or read a book until the rest of the family wakes up. On a quiet morning in mid-October I found myself looking out the glass door on the south side of our house as I prayed, and in what was kind of a strange moment for me I asked the Lord for inspiration. I had been feeling a bit down, photographically speaking, and was having trouble finding motivation to get out and take pictures. It was only an hour later that I saw Beth’s post on Instagram and it was just the spark for which I was looking. I thought to myself “That image is so beautiful, I want to go take one like it.” So I set out later that day with my D750, 50mm lens, +10 and +4 close-up filters, and went to take a picture like the one I had seen earlier. The result of my brief photographic excursion is this image of a Black Cotton flower which, ironically, has very little in common with Beth’s picture. It was hers that sent me on the journey though, and that’s what matters. I have tried, mostly in vain, for years to get a close-up picture of an insect like a bee or butterfly resting atop a flower and you will note that I still have yet to succeed. But going out with that goal in mind, sort of like my recent picture of a couple of bikes, helped focus my mind and give me a clear idea of what to aim for with my camera. Before I shot this picture I took a few others of a small pepper bush and a diamond delight plant at the Price Family Garden and was not extraordinarily pleased with the results I was getting. I was about to leave the garden altogether when I saw this pink flower cradled between deep purple leaves and knew that it was going to make for a good picture. I knew my +10 filter would put me too close and remove any sense of context, so I used my +4 and shot at f/5.6 to get the flower in focus but leave the foreground and background nice and blurry. 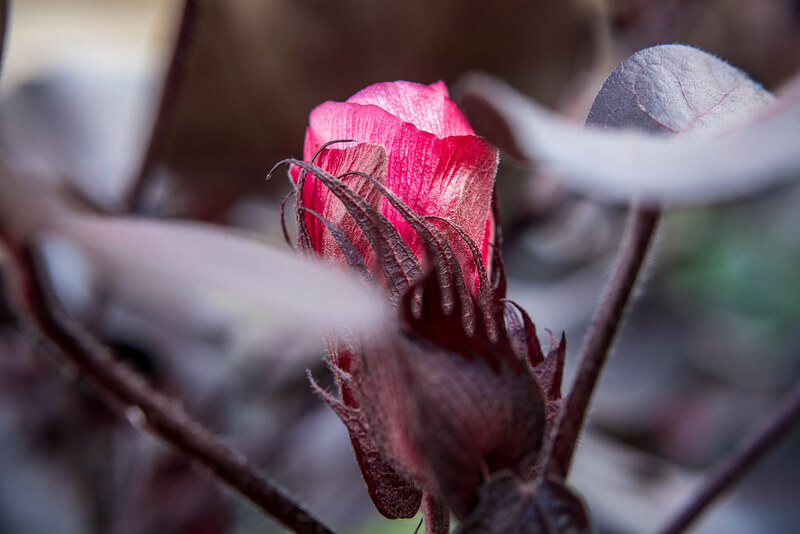 My goal here was to get a sense that this flower is nestled, almost hidden, among the rest of the plant and that the purple fringes surrounding the crimson petals would look like the fingers of a hand delicately holding it in place. I was very pleased with how sharp the final image looked and didn’t use much post-processing on it either, preferring instead to let the image stand on its own. I can relate to the lack of inspiration, photographically speaking. I’ve been in a slump. I have almost 10 years of photos posted on the Blipfoto site. Been a member since 2006. Your image is lovely and I know what my next shot will be. You’re very welcome for the inspiration, Simon! I’m very pleased that this inspired you. I love the photo you got, too! Those quite times are precious, and look, you made a new friend, Benjamin Bee! What a shot of those wings and his face you captured! Nice work, Simon Lord of the Bees! Did you do that picture of the bee and flower with your 10x macro filter? Fantastic! I have one of those; hope i can do just as good!! If you go out on a cold morning when the dew has set, but not yet turned to frost, you will find bees frozen in place on your flowers. One of my favorite photos is of a big bee on a sedum bloom. The wings were wet and shining with rainbows. He had not completely warmed up yet, so I could get very close and work my angles. I do know what you mean about photographic inspiration, especially after the holidays. We need to challenge each other. I’ve never tried that Rebecca, but now I’m certainly going to. Thank you for the idea!